(Daily file photo by Katie Pach) Sarah Johnson attempts a serve. The junior libero had 14 digs against Purdue. Heading into conference play at 10-2 for the second year in a row, Northwestern hoped to get off to a better start this year after losing its first two Big Ten games in 2017. But the Wildcats returned home from a weekend trip to Indiana and Purdue in the same boat as they were last season. NU (10-4, 0-2) first dropped its match versus the Hoosiers (10-3, 1-1), 3-1, on Friday before losing in four sets again to the No. 16 Boilermakers (12-1, 1-1) on Saturday. After losing the first set to Indiana, the Cats evened the match at one set apice with a late-set swing. Down 22-17 late in the set, NU won four straight points to bring the set within one. Then after the Hoosiers secured a kill, the Cats won another four straight points to win the set. In the third and fourth sets, Indiana opened with big rallies. The Hoosiers won seven of the first eight points in the third set and won five of the first six points in the fourth set. Indiana went on to win both sets 25-18 to take the match. Against ranked Purdue, the Cats swiped the first set, 25-22 behind an early rally. NU won seven of the first eight points of the set before taking an 11-2 lead after 13 points played. The early advantage boosted the Cats to the first set victory over the Boilermakers. Following that first set, Purdue turned the tables. In front of a home crowd of 2,415, the Boilermakers cruised to a 25-13 second set victory and then hit .412 in a 25-22 third set win. Purdue then sent NU home empty handed when it won the fourth and final set, 25-19. Sophomore outside hitter Nia Robinson and freshman outside hitter Abryanna Cannon both did not play over the weekend. Both were opening game starters for the Cats and the team leaders in kills per set. 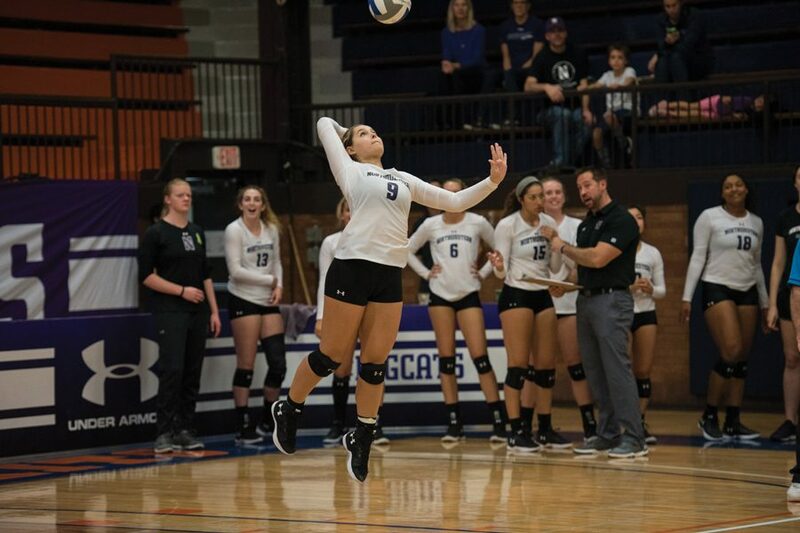 Without their two main focal points on offense, the Cats relied on freshman outside hitter/opposite hitter Ella Grbac and freshman outside hitter Hanna Lesiak in addition to sophomore middle hitter Alana Walker and sophomore opposite hitter Danyelle Williams. Grbac notched 14 kills against Indiana and 15 kills against Purdue, both team-highs, while also leading the team in total attempts. Lesiak had 17 kills over the two games in addition to 19 digs. Williams had double-digit kills in both games while Walker had a hitting percentage of .278. Sophomore setter Britt Bommer and freshman setter Kiara McNulty shared setting duties in the first game of the weekend. The next day, Bommer was the only setter to play, notching 44 assists. NU has not won one of its first two conference games of the season since it won its first two Big Ten contests against Rutgers and Maryland in 2015.